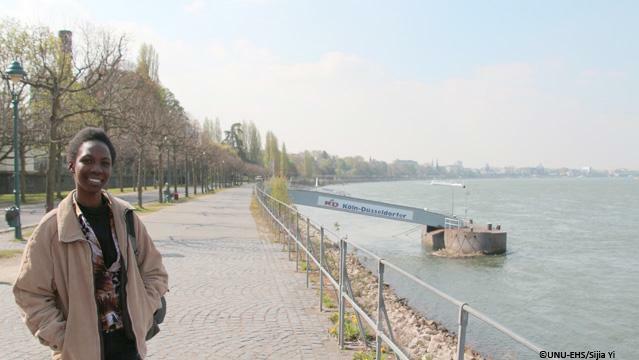 Arriving in Bonn from Ghana last October, Sandra Delali Kemeh, a first year student in the UNU-EHS and University of Bonn International Joint MSc Programme “Geography of Environmental Risks and Human Security”, shares her experience with us during an interview. Why did you choose to apply to the UNU-EHS joint Master’s Programme? One of the reasons I chose to apply to this Master’s Programme is because it is directly related to my previous studies in Geography and Resource Development at the University of Ghana, Legon. I also thought that the Masters’ integrated approach and practical manner were very enlightening. Moreover, as this Master’s is part of a United Nations institution, I saw it as a chance to work within the United Nations framework and as potentially relevant for my future career. In the future, I would like to work as a Project Manager involved in policymaking for an international organization such as the United Nations or the World Bank. I would eventually like to bring my knowledge back to Ghana, but before I do, I would like to work for the United Nations Environment Programme in Kenya. Can you describe your best experience with the Master’s programme so far (e.g. a field trip, course, lecture etc.)? Why? The best course I have had so far is called Concepts and Theories of Social-Ecological Systems. This course made me look at things in a different way. It helped me realize that we cannot take ecosystem services for granted, meaning that our actions can have an impact on the future, even if it is not tangible in the present. I also find Professor Chinwe Ifejika Speranza very inspiring. She is the only African lecturer we have had so far and she is a woman; that really motivates me. What is your opinion of this Master’s Programme so far? I really think that this Joint MSc Programme is a programme worth applying to. It keeps getting better and better every year. We have the chance to have real experts on the subject of Disaster Risk Management, which is a great opportunity for us. Also, the programme is very diverse; there are students from everywhere, including Pakistan, Taiwan, the Netherlands, the United Kingdom and Bangladesh. I’ve experienced so many different worlds since joining the programme. As an international student in Bonn, what was your biggest challenge? When I arrived in Germany, my German was not very good and communicating with other people was a little bit difficult. Even if speaking German was a challenge at first, my level keeps improving now. Germany is also the first country I have ever visited outside of Ghana, so it has definitely been a big adjustment, but it’s very exciting!